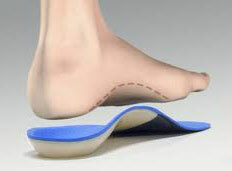 Orthotics are shoe inserts which correct abnormal or irregular foot biomechanics that alter our walking patterns. In a customized and medically qualified process, your feet are evaluated for complete function to assess their success at supporting your entire body. If necessary, prescription orthotics can be manufactured that will comfortably and precisely alter the angles at which the foot strikes a walking or running surface. The result is that you are better able to stand, walk and run more comfortably and efficiently. We work with a number of top-end Canadian laboratories, giving our practice members a diverse selection of orthotics, customized footwear, or if necessary referral to specialists. Edmonton Pain & Injury Clinic has a technologically superior assessment tool, GaitScan, which optimizes orthotic solutions through advanced pressure analysis technology. This improves our clinical evaluation of your feet to provide a clearer picture of your individual foot mechanics. The detailed reporting system will allow us to determine the best treatment solutions for you. We can also make this report available for your medical physician so they have the utmost confidence and certainty your foot health will be in the finest possible condition. In addition, we do casting if required, to fulfill the guidelines for most insurance companies. Prescription orthotics in Edmonton are indeed covered by most insurance companies. If you have any questions about coverage, please speak to Dr. Taha directly. As you stride across the GaitScan pressure plate, 4096 tiny sensors scan the plantar surface of your foot. The GaitScan system records timing sequences during gait and captures the relative pressure load of each area of your foot. GaitScan gives Dr. Taha the ability to look at the plantar pressures of your foot in 2-D or 3-D. He can even view and compare your right and left foot in a synchronized mode. The color graphics and detailed information improves your ability to understand your current condition of your feet and how to biomechanically improve them. It is with great pleasure that we announce the launch of the Orthotic Group customized footwear lineup. Customized footwear is footwear with your custom footbed molded directly into the shoe. Manufacturers such as Florsheim, Hush Puppy, Merrell, Sketchers, Doc Marten, Saucony, Keen, Lacoste, and Naot all have models with a customized footbed. For more detailed information on the benefits and types of orthotics we carry, as well as detailed photos of the most current customized footwear available check out The Orthotic Group.